This camp is specifically targeted toward developing better mental focus for leading trad routes. To accomplish this, we need to develop trust in our gear and jamming ability. Develop this trust by falling on gear, moving continuously when jamming, quick and precise gear placement and improving mental focus through application of the Warrior’s Way. Read Espresso Lessons with emphasis on Preparation and Action Chapters, and the exercises in the Appendix for these chapters. Bring usual climbing equipment plus rope and draws. Bring your trad rack if you have one. A helmet is also required. The cost for each camp varies based on the hosting guide service. Below are approximate costs. Hi John, Thanks for asking. I assume you’re asking about the Trad/Mental camp since your comment is under this heading. We don’t have any scheduled. Closest to you would be the New River Gorge. 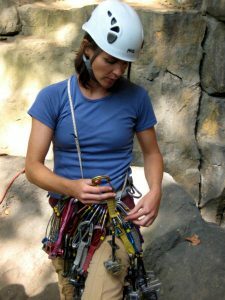 Check with Jeff Hearn (jeff@newriverclimbing.com), our WW trainer at New River Mountain Guides, for individual WW training, if that is an option that could work for you. We do have a Falling and Commitment camp (on sport routes) coming up this weekend at the New. That could give insight into apply WW in trad settings.